East 39th Avenue No.1 — Northern Concepts Ltd. Transitional and luxury, featuring 100 year-old reclaimed fir. This project was started in November 2015 and completed in October 2016. It is located near the highly popular Main Street, and features a main house of 3 bedrooms and 3.5 bathrooms; a basement suite of 1 bedroom and 1 bathroom; and a laneway house of 2 bedrooms and 1.5 bathrooms. In similar style to Pandora Street, it boasts an open concept plan and exceeds the current standards for energy-efficient design. Emphasis is placed on custom craftsmanship and detailed carpentry work, with strong visual components such as exposed rafters and vaulted ceilings. 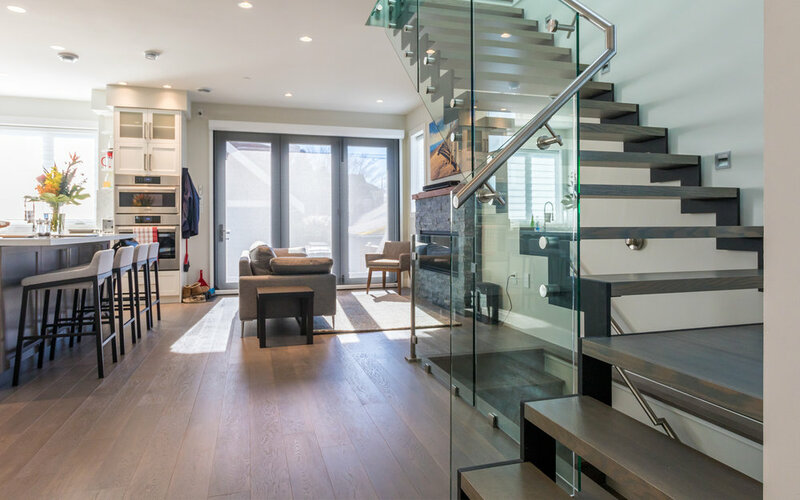 Some of the features seen inside this house includes a steel floating staircase with glass rails and stained oak treads. To further complement the open plan design and maximize the use of open space, the living room opens up to the outside deck and back garden through glass eclipse doors that are perfect for entertaining guests, and still allow in considerable natural light when not in use. An automated solar shade helps manage the amount of light passing through. As with most of our houses, it is designed as a smart home with built-in automation and theatre systems from SONOS. Our lead carpenters were asked to construct some striking individual pieces in this project upon the homeowners request. 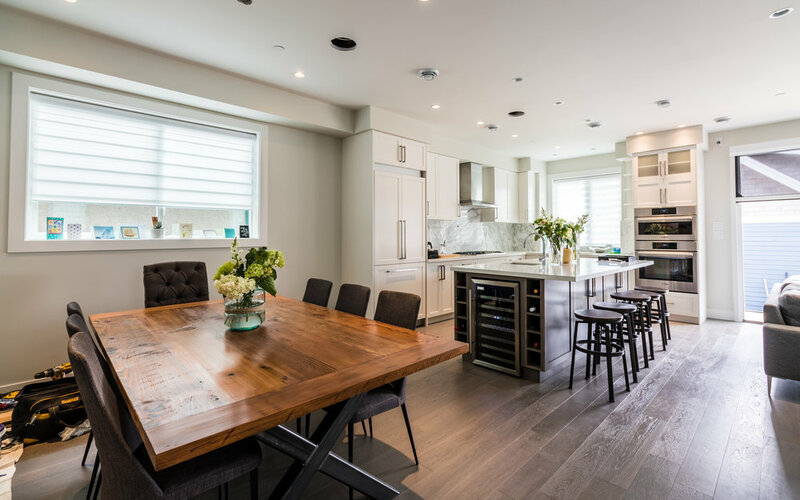 One created a custom dining table from reclaimed 100 year old douglas fir joists that were saved from the original house that stood on this lot. The other created a custom feature backsplash in the homeowners office, also made using reclaimed douglas fir flooring from the original house.